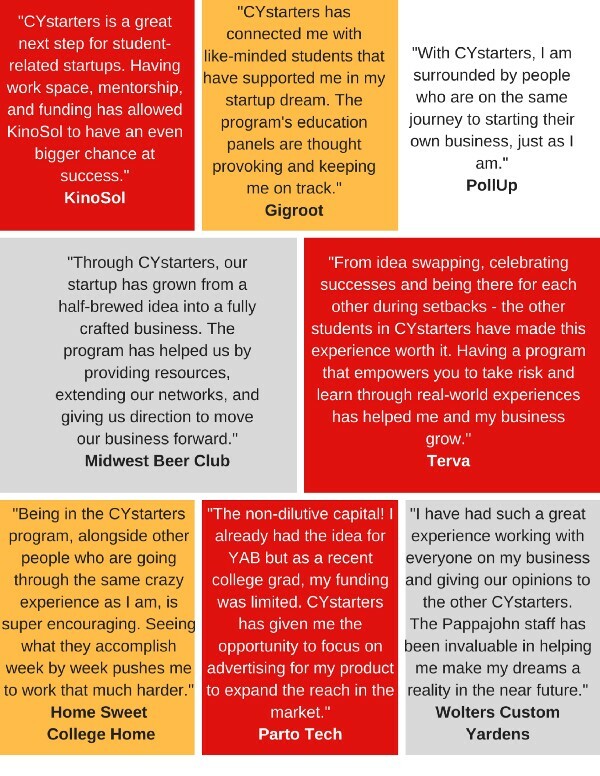 A few words from last year’s student startups participating in CYstarters. L to R: KinoSol, co-founded by Mikayla Sullivan, Clayton Mooney, Ella Gehrke, Elise Kendall; Gigroot founded by Matt Gustin; PollUp co-founded by Kenyon Brown; Midwest Beer Club co-founded by Nick Herrig and Mason Cook; Terva founded by Steven Brockshus; Home Sweet College Home founded by Megan Sweere; Parto Tech founded by Mahmoud Parto; Wolters Custom Yardens founded by Joshua Wolters. It was just a year ago that we introduced what is today our cornerstone program for the ISU Pappajohn Center for Entrepreneurship — CYstarters. Rather than go down the typical internship path or trying to find a job during a student’s summer, we wanted to give Iowa State students and recent graduates the opportunity to dedicate a summer to work or intern for themselves to pursue entrepreneurial aspirations. Through the 10-week accelerator, we provided accountability, funding, collaborative workspace, mentorship, and brought in industry experts & serial entrepreneurs to teach education sessions. Perhaps most importantly, a community was created for the 8 student startups ranging in majors from mechanical & industrial engineering, global resource systems, horticulture, computer science, supply chain, agriculture business, and management information systems. Having a group of interdisciplinary skill sets and knowing that others are in the same crazy boat of starting a business proved to be crucial for each student. U- Conceal-It helps conceals firearms or valuables in plain sight through a customizable and lockable wall safe. In less than 3-seconds, users can quickly get instant access to firearms or valuables for protection in homes. Andrew is a junior studying marketing and management. BulletMatcher has created an automated procedure which uses 3D surface scans of bullets to derive a set of features and scores in the form of a scientific report which can be used to assess whether the two bullets were in fact fired from the same barrel. BulletMatcher’s algorithm quickly provides a score and personalized report so that examiners have a much stronger body evidence to take with them to court. Eric is a Ph.D student studying statistics and computer science. QC Pool Cleaners provides pool cleaning and chemical maintenance for existing pool owners. What started as a simple way to pay for college, QC Pool Cleaners is growing to become a sustainable business as they look to scale. Colby is a senior graduating in chemical engineering and entrepreneurial studies. Hurd Health Group is a bio-medical engineering company developing novel solutions to the most challenging problems with current cardiac devices. The Heart of Tomorrow is the company’s first research and development project, focused on the development of a wireless, pulsing ventricular assist device. Dillon is a bio-medical engineer, Ph.D. student in chemical & biological engineering. Jake Oswald — Simply, Soil. Simply, Soil is a Midwestern company specializing in all things rammed earth and re-inventing sustainable practices to use for building the future. Rammed earth walls are essentially a modernized version of one of the world’s earliest construction methods: compressed soil or adobe. Simply, Soil believes that the future of design might not be so futuristic. Jake is a senior studying landscape architecture. Fast Farm utilizes a mobile platform which allows farmers to specify their equipment needs in less than one minute. The Fast Farm system reaches out to subscribing dealers, finding those dealers in possession of the specific equipment. Dealers ready to make the sale are then able to contact farmers ready to purchase through the messaging services built into the Fast Farm application. Brandi is a senior graduating in agricultural business. True 360 aims to create a 360 degree experience for zoos and aquariums by using cameras and virtual reality to create the ultimate experience for ticket holders. Chris and James are both freshmen studying entrepreneurship and management. Ivory Lane Events is an event planning business that specializes in the wedding industry. By focusing on the needs from small town communities, Ivory Lane Events will offer large decoration inventory, design consultation, a variety of planning packages, and the ability to work with multiple vendors to make a clients’ dream day a reality. Emma is a senior studying event management. Propelled Solutions was created to help save lives by providing first responders with new tools to innovate how they save lives every day through drone technology. In the process of doing so, Propelled Solutions has discovered product needs that go beyond the first responder market. Propelled Solutions drone attachments are innovative in their simplicity, light weight, easy to attach, individually powered and controlled, and cost less than $100. Nolan is a senior studying industrial technology and entrepreneurial studies. RenterGate is an easy to use, web based property management software. Designed for property managers that want to maximize profits, RenterGate offers a solution that optimizes day -to- day maintenance management, improves communication flow, and creates a community to retain tenants. Brady is a junior studying mechanical engineering and general business. Lamb Tactical is solving the safety issue that concealed carriers face daily. The most dangerous part of carrying a weapon is holstering the weapon. Lamb Tactical creates custom Kydex holsters, mag carriers, and wallets to fit the individuals specific guns. Tyson is a junior studying agriculture business. US BioCoatings is creating a soybean-based wax substitute for Brazil (carnauba) wax. The new bio-based wax has unique properties that allow it to serve carnauba wax markets at a half to a third lower in price. It’s high melting temperature and high gloss surface are features for desired auto, floor, and furniture waxes; shoe and other polishes; paper coatings; and food products. Nathan is a junior studying agriculture business, economics, and entrepreneurial studies. 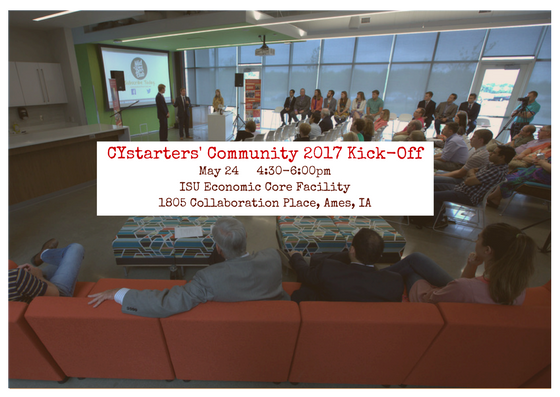 Meet this summer’s cohort at the CYstarters’ Community Kick-off! To RSVP, click here!